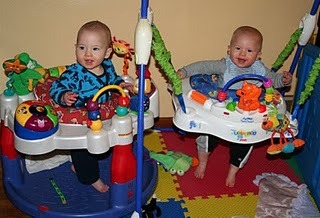 9 months is such a fun age and my favorite part about the boys being 9 months old is definitely watching them interact. They sit next to each other and play, and I am hoping they learn to share soon. 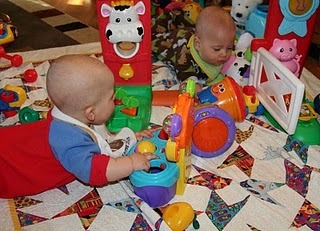 Generally Wyatt is happily playing with a toy and Ruslan decides he wants it and takes it away. Wyatt will get mad and either start to cry or lunge at Ruslan in an attempt to take the toy back – a tug of war over the toy may be involved. We didn’t buy lots of presents for the boys at Christmas. 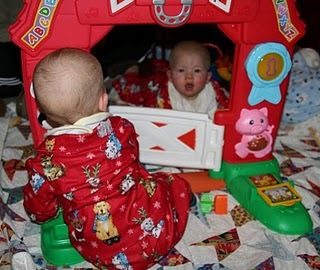 Their one big present was the Fisher-Price Learning Farm and they play with it everyday. 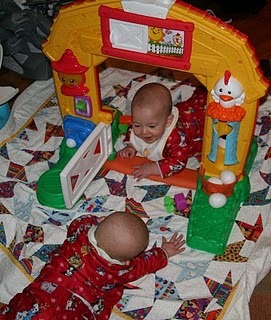 Since it is double-sided they can each play on one side and watch each other through the doorway. 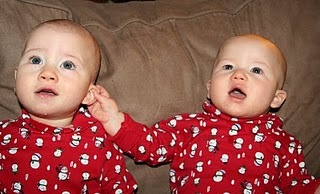 They also love to grab at each other – ears, mouth, feet – I don’t know what they think they are going to do with their brother’s ear once they get a good grip. Ruslan’s third tooth came in this month – top-left, middle and Wyatt has a third tooth on the top as well. 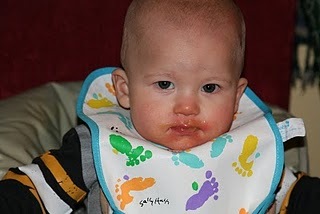 They continue to eat their way through all of the 2nd foods as well as puffs and rice cakes. And they still have 4 bottles each day. 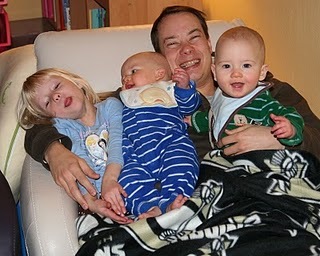 Both boys had their first sick + fever episodes at the end of December / beginning of January. Wyatt is extermely miserable and needs to be held for hours (even at night) when he has a cough and sore throat. Ruslan developed the first ear infection at the begining of January and started a second round of antibiotics a few weeks later when his left ear was still infected. 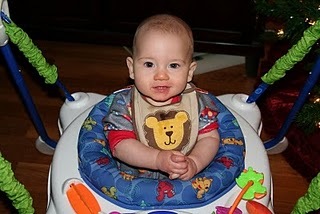 At their 9-mo appt Wyatt was diagnosed with his first ear infection (left ear) and started antibiotics. 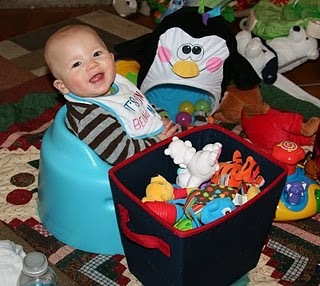 Ruslan was home for 2 days while Wyatt was at daycare – this was the first time they have been separated for more than a few hours. Wyatt was much fussier than normal on those days and so very excited when he came home and saw his brother. 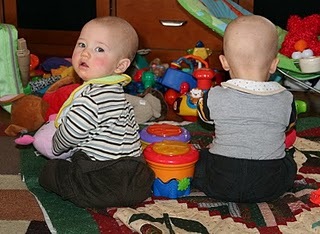 They are both sitting well now and Ruslan continues his adventures in backwards crawling. He gets where he wants to go, it just takes a lot longer than going forward. Wyatt gets around as well, but not on all 4’s quite yet. They are having their nighttime bottle and going to bed for the night between 7:00 and 7:30. And at least one of them makes it until morning each night. Often times one of them wakes up and is sad enough to need to be comforted back to sleep. We are trying to give them time to fall back asleep on their own and the past few nights have been good. They wake up between 6:00 and 7:00, hoping that shifts closer to 7:00 everyday soon. 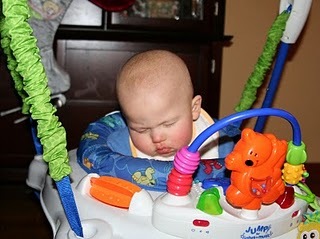 And over the past month, they have finally started taking longer naps at daycare. Previously they would only nap for 30 mins at a time even though they napped for hours at home on the weekend. Now they are both getting at least one nap longer than an hour and usually two. That makes for much happier babies in the evening.